Freshwater and sediment management in estuaries affects water quality, particularly in deltaic estuaries. 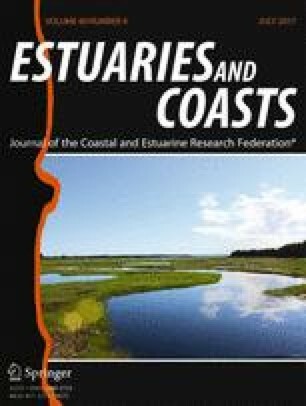 Furthermore, climate change-induced sea-level rise (SLR) and land subsidence also affect estuarine water quality by changing salinity, circulation, stratification, sedimentation, erosion, residence time, and other physical and ecological processes. However, little is known about how the magnitudes and spatial and temporal patterns in estuarine water quality variables will change in response to freshwater and sediment management in the context of future SLR. In this study, we applied the Delft3D model that couples hydrodynamics and water quality processes to examine the spatial and temporal variations of salinity, total suspended solids, and chlorophyll-α concentration in response to small (142 m3 s−1) and large (7080 m3 s−1) Mississippi River (MR) diversions under low (0.38 m) and high (1.44 m) relative SLR (RSLR = eustatic SLR + subsidence) scenarios in the Breton Sound Estuary, Louisiana, USA. The hydrodynamics and water quality model were calibrated and validated via field observations at multiple stations across the estuary. Model results indicate that the large MR diversion would significantly affect the magnitude and spatial and temporal patterns of the studied water quality variables across the entire estuary, whereas the small diversion tends to influence water quality only in small areas near the diversion. RSLR would also play a significant role on the spatial heterogeneity in estuary water quality by acting as an opposite force to river diversions; however, RSLR plays a greater role than the small-scale diversion on the magnitude and spatial pattern of the water quality parameters in this deltaic estuary. The online version of this article (doi: 10.1007/s12237-016-0197-7) contains supplementary material, which is available to authorized users. The study was supported by the US National Oceanic and Atmospheric Administration (NOAA) through Louisiana Sea Grant (grant R/OA-15) and by the US Geological Survey (USGS) Ecosystem Mission Program. Computational resources were provided by the Louisiana Optical Network Initiative (LONI) and Louisiana State University. We would like to thank John Day, Robert Lane, and Robert Twilley for field water quality data. The Louisiana Coastal Protection and Restoration Authority (CPRA) and the Water Institute of the Gulf provided bathymetric data and the design of Caernarvon diversion. We would like to thank Dr. Qinghua Ye from Deltares for technical assistance using the Delft3D model. We are grateful to two anonymous reviewers for their constructive reviews of an earlier draft of this report. Any use of trade, firm, or product names is for descriptive purposes only and does not imply endorsement by the US Government. Coastal Protection and Restoration Authority (CPRA). 2012. Louisiana’s Comprehensive Master Plan for a Sustainable Coast. State of Louisiana. http://coastal.la.gov/a-common-vision/2012-coastal-master-plan/. Couvillion, B.R., G.D. Steyer, H. Wang, H.J. Beck, and J. Rbczyk. 2013. Forecasting the effects of coastal projection and restoration projects on wetland morphology in coastal Louisiana under multiple environmental uncertainty scenarios. Journal of Coastal Research SI (67): 29–50. doi: 10.2112/SI_67_3. Sasser, C.E., Visser, J. M., Mouton, E., Linscombe, J.. 2008. Vegetation Types in Coastal Louisiana in 2007. USGS Open-File Report 2008–1224. http://pubs.usgs.gov/of/2008/1224/.